Delivers more calories in less volume than a standard 1.0 calorie drink. 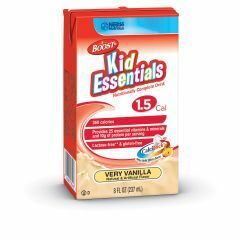 BOOST® KID ESSENTIALS 1.5 drink is the first calorically dense pediatric formula. It delivers more calories in less volume as compared to standard 1.0 formulas. May be consumed orally or used as a tube feeding. It is rich in calcium to help build strong bones. CalciLock® blend of essential nutrients to help support healthy bone development. CalciLock®is a combination of essential nutrients to help build and maintain strong bones. This nutrient blend includes calcium, phosphorus, magnesium, zinc, and vitamins D, C & K and is designed to help support healthy bone development. Available in three flavors: very vanilla, chocolate and strawberry. We replaced our Pediasure with this product to deliver more calories in the same volume for our 3 year old with failure to thrive. We add Duocal to get in even more calories. Tastes great, too! Produces Results. Good Taste. Simple To Take. This gives us the extra calories he needs, and he likes the taste. Other similar drinks didn't have a good taste and so he wouldn't drink them. It's kind of pricey, but we feel it's worth it. Simple To Take. Produces Results. Very underweight 18 month old twin boys. They both gained faster with the use of Kids Essentials. No longer have the FTT status. Produces Results. Simple To Take. Good Taste. My son was born at 27 weeks and suffered from severe reflux. We have been using this drink (1.5) for over a year (Used to be called Resource 1.5 for Kids). It has been a life savor in getting quality nutrition with lots of calories in a little food. He is still underweight, but this drink has made huge progress in his overall health and weight. Pediatric use. Short-Term Solution. Daily Use. We use this for our two year old son to supplement his nutrition.